In 2018, Longleat's extraordinary Festival of Light will take you on a fantastic voyage. 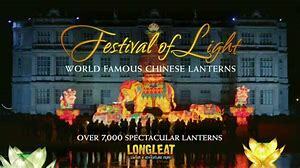 More than 645 breath-taking, illuminated lanterns, adorning over 30 acres of splendid 'Capability' Brown landscaped grounds, will transform Longleat as darkness falls. This year Longleat are inviting guests to join a thrilling expedition around the world, journeying through time and space with three new characters, Harry and Bea, a plucky brother and sister, and their fearless terrier companion, Monty. In each lantern scene the intrepid trio can be found exploring wondrous locations, from the exotic to the glacial, filled with astonishing creatures, magnificent scenery, stunning structures and sensational modes of transportation. Marvel as the aeronautical heroes take flight, suspended amongst the clouds in a glorious hot air balloon. Be amazed as they trek by camel to the immense Great Pyramid of Giza towering 20 metres into the night sky, and gaze in awe at the 28 metre-long classic train, the Longleat Flyer, as it glides through the dark in a cloud of steam. Guests will be enthralled as a rocket ship blasts off into the dazzling solar system, gargantuan dinosaurs loom from prehistoric vegetation and medieval knights on horseback surround a castle's battlements with bows and swords drawn. The seasonal spectacle continues with the 50ft enchanted Christmas Tree Show, Longleat House dressed for a 1920s Christmas and the much loved Santa Train. 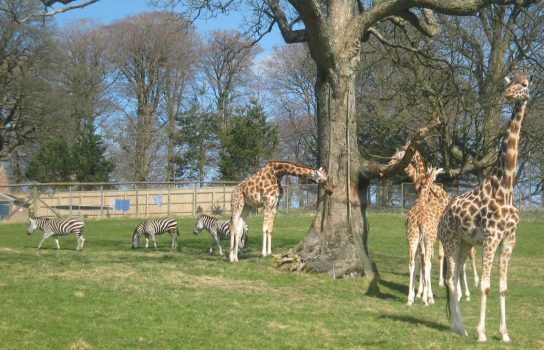 You can also enjoy all of their popular animal and adventure attractions, including the Safari Drive-through, Jungle Kingdom, Penguin Island, Jungle Cruise and Longleat Hedge Maze. We are due to arrive at Longleat at approximately 12pm and we will go straight into the Safari Park, which takes about an hour and a half. After this we are free to explore the house the light show around the park. As we are due to arrive at lunchtime and go straight into the Safari Park, you may wish to take a picnic lunch with you to eat on the coach.